Vintage Super Scale P51-Mustang R/C Model Kit, c1979: Near Complete, Excellent! 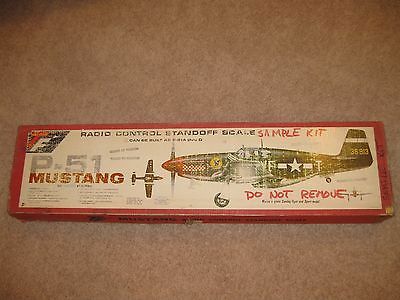 Vintage Super Scale P51-Mustang R/C Model Kit, c1979: Near Complete, Excellent! Large Scale R/C Kit is complete except missing original kit decal sheets; I am providing an alternate sheet of decals from a similar-scale P-40 Warhawk which should provide a nice substituteMeasurements: wingspan: 60″; build weight: 5.5.-6.5 lbsEasy-to-follow instructions, large blue-print like assembly plans; balsa, plywood plastic construction; clear canopy, molded exhausts, machined parts, nylon fittings, very nice kitBox has less than average wear-tear for its 37+ years, very serviceableNOT included in kit (purchase separately): Monokote covering, engine, radio control, fuel tank and lines, wheels, prop, spinner and glueMODEST starting price, NO reserveGood luck and Good bidding!